We are Council 13160. Chartered in 2002, we take our name in honor of Msgr. James Supple who started St. Thomas Aquinas parish in 1942 on the south side of Iowa State's campus. We are one of the four college councils in Iowa. Since we are also tied to the parish of St. Thomas we have a unique mix of college guys and resident parishioners. It is our mission to take care of not only our brothers and their families but those in need on a local and global scale. The money we raise every year through numerous fund raisers is given to charities including Special Olympics, Friendship Ark, The Gabriel Project, The Emergency Residence Project, and The Campaign for People With Intellectual Disabilities. The council also support parish projects such as the Lighthouse Media Kiosk, mission trips, and the priest's vestments. We as Knights here at St. Thomas feel called to provide other services to the parish as well, the biggest of which is fish dinners during Lent. The council does not make a profit off of the fish dinners, but instead continues to put them on every year as a service to our parishioners. "Thanks to the efforts of Father Michael J. McGivney, assistant pastor of St. Mary’s Church in New Haven and some of his parishioners, the Connecticut state legislature on March 29, 1882, officially chartered the Knights of Columbus as a fraternal benefit society. The Order is still true to its founding principles of charity, unity and fraternity. 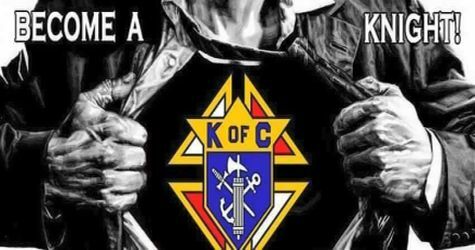 We are the Knights of Columbus, serving mother Church and those in most need. Everything we do is based on charity, unity, fraternity, and patriotism. We are Catholic men striving to be better husbands, fathers, brothers, and servants of God.